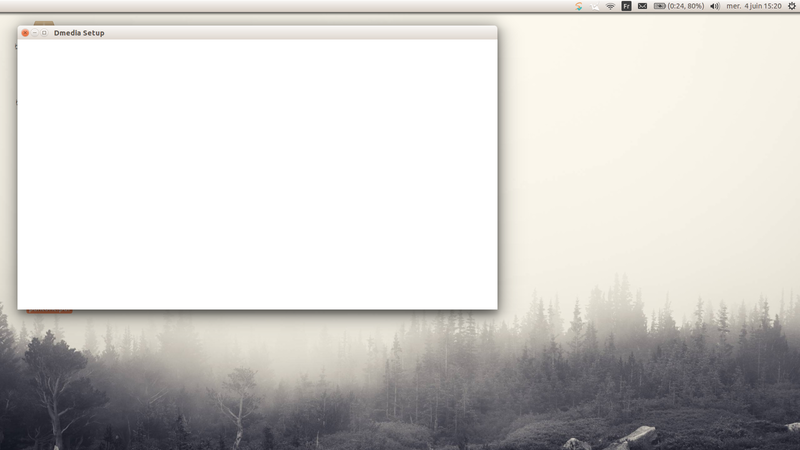 I have installed novacut through the ppa in ubuntu 14.04 but starting novacut (dmedia) shows an empty window. Eric, thank for the bug report! Yup, it's sure not supposed to look like that! Can you give me a few more details on your setup? * Was this a fresh Ubuntu 14.04 install, or an upgrade from previous versions? * i386, amd64, or something else? * What processor, and are you using an SSD or a platter drive? My pc is a samsung 9 serie with a core i5 with intel graphic card 4gb ram and a 128 gb ssd inside. Have you tested it on a 14.04 64 bits ? It seems more like a dependency problem don't you think ? With the new release, it is still not working. Launching dmedia through the terminal gives no more info. I am surprised it seems not to work only for me but on all my machines !! I have uploaded the new version of dmedia today and it is still not working. Any idea I would love to use novacut again. thanks for the update... so is the failure still the same? you get a blank window? occasionally when using a slow (or even failing) HDD, i've encountered the UI loaded very slowly, but I haven't been able to reproduce this completely blank window yet. does the result you're currently experiencing still match the original screenshot you attached? Yes it is still matching the screenshot and it is doing exactly the same thing on every computer I own which run on a completely different hardware. I am very suprised I may be the only one to experience that on all my machines ! are there any commands I could enter or any log file I could submit to help you debugging ? Thank's for tagging the problem as critical.